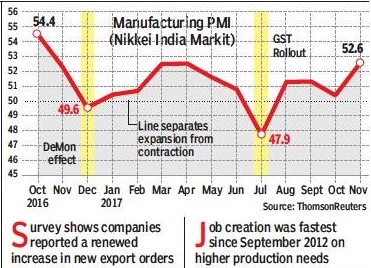 The Indian manufacturing sector recorded its strongest improvement in business conditions in 13 months on the back of new orders and increase in output. 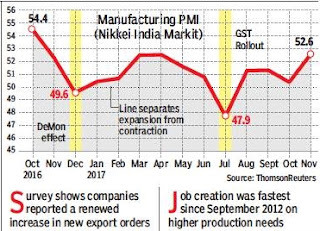 The Nikkei India Manufacturing Purchasing Managers Index showed that companies reported a renewed increase in new export orders in November. The PMI index rose to 52.6 in November, from 50.3 in October, displaying the strongest improvement in manufacturing conditions since October 2016. The PMI survey is based on data compiled from monthly replies to questionnaires sent to purchasing executives in over 400 industrial companies and is a closely watched data set. On the jobs front, greater production requirements led to the fastest rate of employment creation since September 2012. Meanwhile, there was a pickup in inflationary pressures, with input costs increasing to the greatest extent since April. The PMI data for November is the latest in the string of positive data that has emerged for the economy. Data released by the Central Statistics Office earlier showed the Indian economy grew 6.3% in the July-September quarter, up from 5.7% in the previous quarter, on the back of a strong manufacturing sector performance. The manufacturing sector had been hit hard by the government’s move to scrap some high-value notes in November last year, while implementation issues linked to the goods and services tax had hurt businesses. The sharp cut in GST rates for more than 200 items had also helped boost sentiment in the sector. While there are some weak spots in the manufacturing sector and overall economy, data now points to a recovery and policymakers are optimistic that growth will be sustained and durable in the months ahead.